There are a lot of hucksters who will tell you that any old playing-card shoe is as good as another. But do yourself a favor: don't gamble on some Jack of Diamonds Clogs or King of Spades Go-Go Boots. Since the trump card depends upon the game, you'll need to read the rules before you know which footwear will carry you to victory! Sure, most of the time it's all about the face cards. So maybe you were thinking about hedging your bet on a set of Ace of Clubs Elevators. But if you get stuck holding a couple of aces in Rummy 500, your score is going to take a big hit. And what about Crazy Eights? Some games are on a different level. Like croquet! Because there are people who insist on wearing footwear inspired by certain playing cards, even when whacking a hedgehog with a mallet. 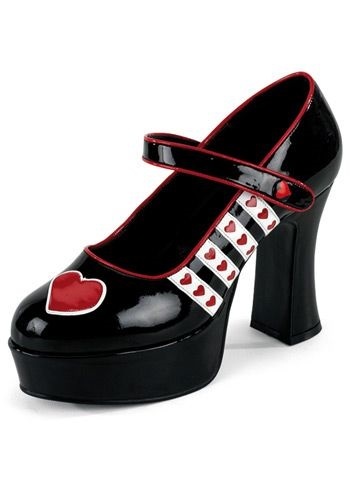 That makes this classic Mary Jane style platform shoe--decorated with orderly yet playful red and white hearts--tops! These shoes are awesome. They will be a hit at any costume gathering. You will tower above the crowd. If the outfit does not get them your height will.